Circus favourite Cirque Berserk comes to London for a limited West End engagement, playing at the Harold Pinter Theatre as part of an extensive national tour. Now entering its fifth year, the breath-taking show celebrates the 250th anniversary of the creation of Circus, bringing to life well-known jaw-dropping acts with a contemporary twist. With acts ranging from tumbling to weapon-throwing, arrow-shooting to strap acrobatics and juggling to dance, Cirque Berserk has it all! Featuring a variety of acts that encapsulate everything that is Circus, the production stars a talented troupe from around the world who are prepared to perform death-defying feats for the crowd’s entertainment. Cirque Berserk’s acts include the Timbuktu Tumblers, Bolas Argentinas, Odka, Tropicana Troupe, Jackie, Germaine Delbosq, Toni, Zula, Laci, Jose and Gaby, the Berserk Dancers and Aerial Ballet, Giant Robot, Tweedy and The Mustache Brothers, as well as The Lucius Team, who perform the legendary motorcycle ‘Globe of Death’. 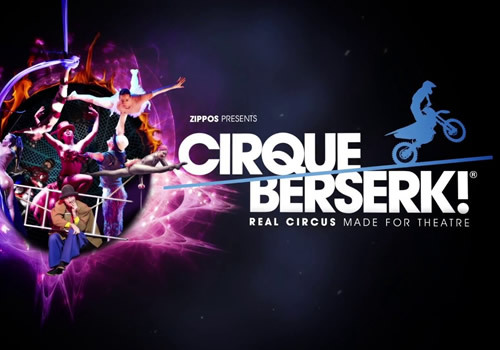 Founded and produced by performer and entertainer Martin ‘Zippo’ Burton, Cirque Berserk features a team including creative director Julius Green, movement director Dede McGarrity, set designer Sean Cavanagh, lighting designer Mike Robertson, sound designer Matthew Bugg and costumer designer Dianne Kelly. An electrifying production that is guaranteed to have audiences on the edge of their seats, the hair-raising Cirque Berserk plays a strictly limited season at London’s Harold Pinter Theatre, running from April 19th to May 7th 2018. Cirque Berserk is suitable for those aged 5 and up.